Natural gas is one of the safest, cleanest, and most functional fossil fuels found on Earth. Its uses are vast and range from electricity generation, heating, cooling and hundreds of others. One of the largest industries in the world, natural gas has application in both residential and commercial industries. Billions of dollars are spent each year locating, manufacturing and drilling natural gas. Its development creates thousands of jobs and has a large impact on the U.S. energy market. Natural gas is a combination of several types of hydrocarbons. These are gasses whose molecular structure is a combination of hydrogen and carbon atoms. While natural gas can contain nitrogen, carbon dioxide and hydrogen, the number one hydrocarbon component is Methane gas. It is the Methane gas that makes natural gas valuable for use as a fuel because of its uses in combustion. There is a great abundance of natural gas to be found in the United States and the world at large, making it a very attractive option for powering our world. The top three natural gas producers in the world are Russia, the United States, and Canada. The United States has over twenty-five large natural gas producing plays, the largest of which is known as Anadarko Basin. The Basin stretches through Oklahoma, Texas, Kansas and Colorado and produces 100 trillion cubic feet of gas. 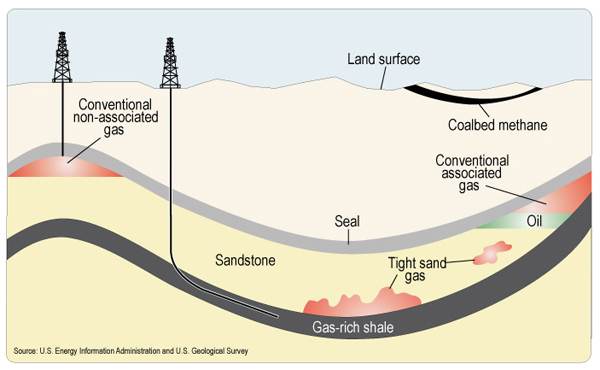 In order to extract natural gas from the Earth it needs to be drilled. For reserves found in shallow locations, a process known as cable tool drilling is used. This method chisels through the earth by continually sinking a large metal bit into the ground. Natural gas found deeper in the Earth is extracted using a different process known as rotary drilling. Rotary drilling uses a spinning drill bit to burrow into the earth in order to reach natural gas deposits. Once drilled, the uses of natural gas are immense. 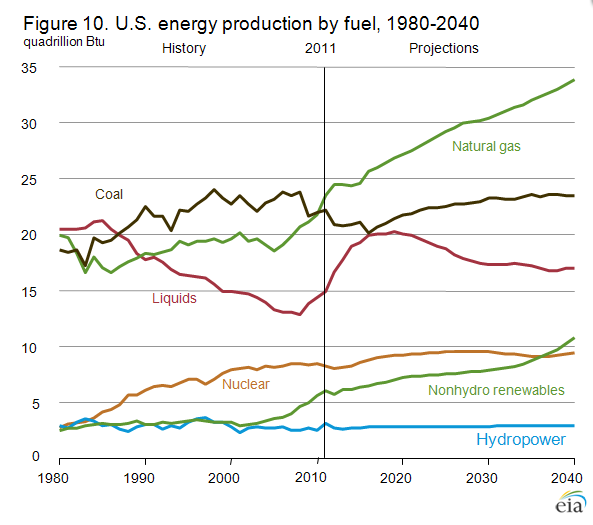 Natural gas is a key resource in electricity generation. Compared to its coal-powered counter-parts, electrical generation powered by natural gas produces nearly half the harmful carbon dioxide pollution. There is a large push in the United States to reduce the use of coal powered plants in lieu of natural for this reason. In the home, natural gas is used to power many appliances. Heating and cooling systems can be powered through natural gas. Many stoves, furnaces, and hot water heaters are powered by pumping natural gas into homes. Outside the home, gas is used in a number of manufacturing processes including plastics, paints, glass and steel. Natural gas is one of the most abundant forms of fossil fuel energy in the United States, and as such has a large impact on the U.S. Energy market. Comprised mainly of the hydrocarbon Methane, using natural gas for electrical generation is one of the cleanest and environmentally friendly fuels on the planet. As more drilling sites are discovered and more gas extracted, it will continue to see uses both domestically and industrial processes for years to come.